You guys haven't heard from me in more than a year. Many strange changes in my life since I was a full-time student of Cree (as a language) at F.N.U. I actually tried to study First Nations languages at UVic: they had one professor specialized in Cree, but they* refused to let it happen. They also had a circle of students studying Ojibwe independently on campus. The whole department was hollow: nobody at UVic is learning/teaching any First Nations language (neither west-coast nor otherwise). They just do linguistic methods. Depressing as hell. I spent 7+ months in a language-school in China, 1-on-1 with the teacher, 4 hours per day, 5 days per week in the classroom. This is exponentially more effective way to learn a language than university classroom methods (1 hour, twice a week, with 40 students in one room, etc.) --but expensive, of course. There's nowhere in Canada you could study Cree for 4 hours per day, 5 days per week --not at any price. Let me tell you: it works (especially for listening-comprehension, a huge advantage over textbook-based methods). I'm now living on the border between Myanmar and Yunnan (Dehong) —a beautiful and fascinating part of the world with several (endangered) indigenous minority languages (two of them are taught at the university here: Jingpo (a.k.a. Kachin) & Dehong-Dai (a.k.a. Tai Neua)). 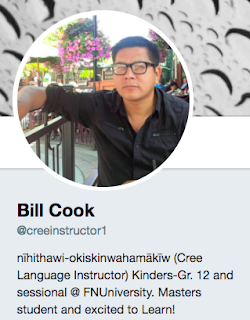 Yes, in many ways, my heart still belongs to the endangered languages of Canada (Cree & Ojibwe, specifically) —but even a mainstream language like Chinese doesn't really lead to any employment in Canada. Maybe I can get a job as a Chinese speaking cop, i.e., in the regular police service. MAYBE. Title, "Career: Painter, Baker, PhD, Language-Educator… or What?" I do have videos on that channel about my experience studying Cree, and how it was basically what I wanted to do with the rest of my life, etc., but the university system in Canada was just too lousy for me to continue with it (I couldn't find an option ANYWHERE, coast-to-coast, to continue with Cree or ANY First Nations language, and I searched for years, had email with professors for years, etc.) —I was going to include links to those videos, but looking at them now, I think you'd find them really boring, TBH. This one was titled, "Why I started learning Cree (Nêhiyawêwin)". "Learning languages: how did this become such a major part of my lIfe?" Yeah, honestly, I think you'd find both of those videos pretty boring. But, hey, maybe it isn't so often that a white guy who ISN'T a Christian missionary really wants to learn Cree, and talks about his reasons for doing so.